A look at some top performers and storylines from Day 3. 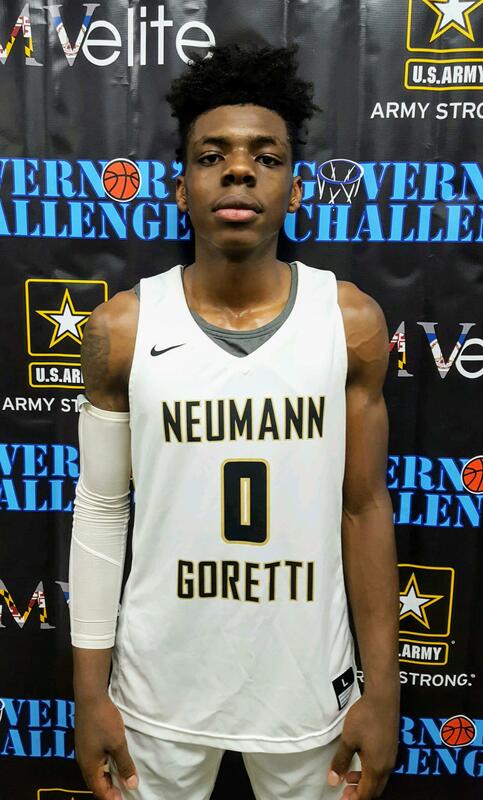 Neumann-Goretti (Pa.) 2019 guard Chris Ings. SALISBURY, MD - Day 3 of the 2018 Governor’s Challenge may have been the best yet, as illustrated by a pair of 3:15 p.m. thrillers at the Wicomico Youth & Civic Center on Friday. The two-court setup had observers furiously trying to follow the action on Courts 1 and 2, as Neumann-Goretti (Pa.) vs. Dulaney (Md.) and St. Andrews (RI) vs. Central Pointe (FL) each featured frenetic overtime finishes. Neumann-Goretti held off Dulaney 83-78 in triple overtime, while St. Andrews outlasted Central Pointe 69-65 in OT. That definitely proved to be the case. At first, it appeared Neumann-Goretti would triumph in runaway fashion, as it mounted a 20-point lead toward the end of the first half and ran it up to 20 once more in the third quarter. But Dulaney, behind fierce efforts from 2021 guard Ryan Conway (19 points, six assists), 2020 guard Che Evans (15 points, 10 rebounds), and 2020 forward Cameron Byers (19 points, 10 rebounds), chipped away - pulling to within 10 by the end of the third quarter and then powering ahead, 53-52, when 2021 guard Isaiah Cornish converted a three-point play with four minutes to go. The Lions led by as many as five with 2:02 left in regulation, but the Saints rallied to force overtime on a 3 by Ings, which led to two more extra periods. On Court 2, meanwhile, Central Pointe and St. Andrew’s were trading buckets. After St. Andrew’s erased a 12-point deficit late, Central Pointe’s Luis Rolon buried a 3-pointer to force overtime. Behind Syracuse-bound 2019 guard Brycen Goodine (16 points, five rebounds, four assists) St. Andrew’s found a way. When Michael Powell took over Archbishop Carroll in 2017 - a program that was winless the season before with a reputation of acting as the caboose of the ultra-competitive Washington Catholic Athletic Conference, one motive was prioritized: transparency. Powell’s story is that of an accomplished coach who cares for everyone he comes across. He also is a director for Team Durant, a respected AAU program in the Metropolitan area. What it might look like, in terms of on court product and competition, is a cutthroat and grueling process, competing against some of the nation’s top program’s right in the conference. On Friday, Archbishop Carroll defeated Wings (NY) 78-64 for its fourth win in a row and 21st victory over the past 40 games since Powell took the reins. Last year, the Lions went 17-12, as Powell established a winning culture from the onset. This year, he says, is centered around a beefed up schedule with more of national presence. “We established that winning mentality last year. This year we’re focusing on a national schedule to show the kids where we want to be,” Powell said. 2022 guard Trey Thomas, who put up a team-high 18 points in the win Friday, chose to attend Carroll over neighboring powers like St. John’s (DC) and Gonzaga (DC) because of the opportunities Powell presented. "Carroll is a great school,” said Thomas, a 6-foot-3 guard with promise. Alongside Thomas, new faces include 2020 guard Keyshawn Johnson, a transfer from Wise (Md. ), 2021 guard Jaylen Hall, a transfer from DeMatha (Md. ), and 2021 forward Kyrese Mullen, a Virginia Beach native. Powell also has one of the more heavily recruited big men in the District in 2020 center Tegra Izay and 4-star football recruit at offensive line, 2020 forward Anton Harrison. Powell is also the director admissions at Carroll, which is known for its engineering program that partners with a host of local colleges. Carroll also recently launched the Jim Vance Media Broadcast Program, which offers full tuition for students looking to become on-air talents. Additionally, the school was recently renovated, including a new track and field, and gym. Three of Carroll’s four consecutive wins have come at the Governor’s Challenge. It started Tuesday with an 83-50 rout of Delaware’s St. Georges and continued with a buzzer-beating, 54-53 win over Olympic (NC). Powell hopes to ride this momentum into the new year and perhaps eclipse the 17-win mark his team posted last season. As his Walt Whitman Vikings continued to find answers with such stoicism and cohesiveness against a bigger, more athletic New Town team, Coach Chris Lun perched along the sideline, soaking in this display while preparing his team for the next play. Over the summer, Lun entered his team in the Capitol Hoops Summer League at DeMatha Catholic High School, where they played Washington area powerhouses Bowie (Md. ), Paul VI (Va.), St. John’s (DC), and Wilson (DC). Those scrimmages weren’t necessarily close, but the results didn’t matter as much as the opportunity and developing mettle for big-stage moments. On Friday, those summer hours helped Whitman score a 49-43 win over New Town, as the Vikings distorted the Titans’ offense with a packed-in 2-3 zone while hitting seven 3-pointers. From a personnel standpoint, New Town figured to overmatch Whitman, with seven players over 6-feet-5, including 6-foot-8 2021 center Julian Reese. But the Vikings, led by 6-3 2019 guard Brendan Shaver (15 points, eight rebounds), stayed the course and were never fazed. For the game, Whitman shot 34.7 percent (17 of 49) while New Town mustered 27.1 percent (16 of 59). Lun emphasized packing in his 2-3 zone with Shaver one of the guards up top and 6-7 2019 center Rodrigo Lopez (nine rebounds, three blocks) patrolling the middle. “We told the guys before the game, ‘If they are going to beat us, they’re going to have to hit from the outside,’ “ Lun said. And that’s what the Vikings were able to do, as the Titans missed 21 of their 22 attempts from downtown. New Town’s only 3-pointer came in the first quarter, when it led 17-15 through eight minutes. New Town regained the lead late in the third quarter, 32-29, before Whitman rattled off a 9-0 run to take the lead for good with 6:30 left in the contest. Whitman 2019 guard Jason Lewis added 14 points and 2020 guard Josh Weinberg posted 13 points and seven rebounds. The win moves Whitman, an MPSSAA 4A West title hopeful, to 3-3 on the season. Their losses have come to private schools Georgetown Prep, 54-48, and Landon, 88-51, as well as Springbrook, 71-59. Whitman will now play Sussex Tech (DE) for the Bracket 10 title Saturday at 5 p.m. at Wicomico High School.